Forum supports DuPagePads and their efforts to end homelessness in DuPage County, Illinois. 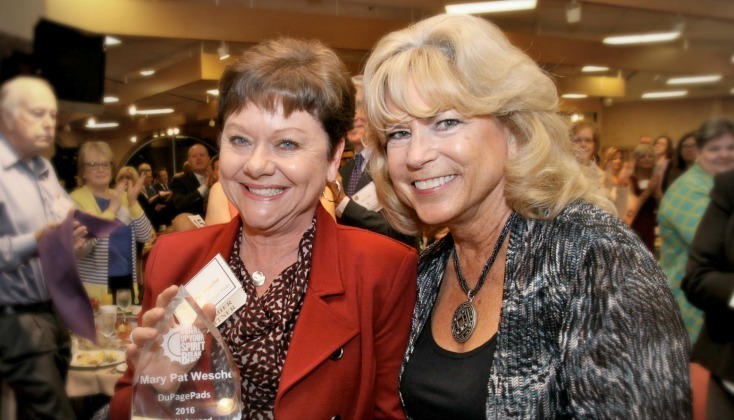 Forum Partner Mary Pat Wesche has worked with DuPagePads for 20 years, including serving as a past president of its Board of Directors and chair of its Program committee. In 2016, Mary Pat received the DuPagePads Spirit Award for her work with the organization. We asked Mary Pat about what DuPagePads means to the local community. “I started volunteering with DuPagePads about 20 years ago as a way to show my children that not everyone in DuPage County lived a comfortable life. We started by supplying food to be served at one of the overnight sites near Wheaton. The more I became involved with the organization, the more impressed I was with the leadership, the commitment of the staff and everything they were accomplishing. Mary Pat currently serves as an advisor to the Finance committee for DuPagePads and a board advisor and member of its Program committee. Upon joining DuPagePads, Mary Pat supported expanding services beyond overnight programs to permanent housing initiatives. Founded in 1985, DuPagePads is committed to ending homelessness in DuPage County. Bringing together civic, faith-based and social services groups, local businesses and human service agencies, DuPagePads addresses the needs of the homeless population with the support of more than 4,000 volunteers. For more information, visit dupagepads.org/.